Western WY- The fire danger rating for Grand Teton National Park, Bridger-Teton National Forest and Teton Interagency Dispatch Area has increased to very high. Conditions in the area are drying quickly and a fire may start easily, spread quickly and burn intensely. There are no fire restrictions at this time, but everyone is asked to practice heightened fire safety at all times. Fire managers use a variety of factors to determine fire danger ratings including the moisture content of grasses, shrubs and trees, projected weather conditions (including temperatures and possible wind events), and the ability of fire to spread after ignition. Recent hot temperatures, low humidity and lack of measurable precipitation have combined to increase the potential for fire activity across the Teton Interagency fire area. The national fire preparedness is at the highest level. This means that firefighting resources are responding to numerous incidents across the western United States. 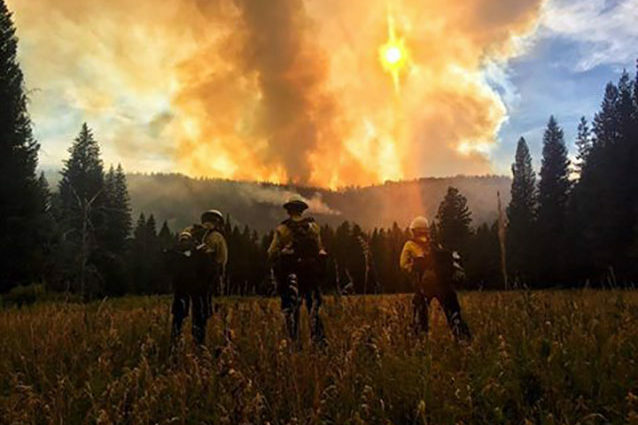 Many Teton Interagency fire-fighting resources are available for initial response in the local area, and some resources are supporting large fires in other areas. Teton Interagency fire personnel have extinguished almost 50 unattended or abandoned campfires this summer. Abandoned campfires can quickly escalate into wildfires, and it is extremely important that all campfires are completely extinguished and cold to the touch before campers leave their site. Visitors should never leave a fire unattended and can be held liable for suppression costs if their campfire becomes a wildfire. Operators of unmanned aircraft systems, UAS or drones, are reminded that flying near a wildfire is prohibited, and illegal. Drones can shut down fire-fighting operations which may put firefighters, residents and property at risk. Aerial resources recently had to be stopped on a wildlife fire in Idaho due to a near-miss midair collision.